By now I think most people know that the 1621 Thanksgiving feast between Pilgrims and Indians is a myth. But I still find it fascinating to look at how artists have either played a part in perpetuating the warm-fuzzies with traditional Thanksgiving scenes or unmasking tradition for the farce it truly has become. You see, though the origins of the holiday are loosely traced back to a grand feast between Indians and Pilgrims— btw, it was actually prompted by a good harvest, not the benevolence of local tribe helping starving Piligrims— the celebration without question has become an important tradition in American culture, but not for reasons of family gathering or thankfulness. 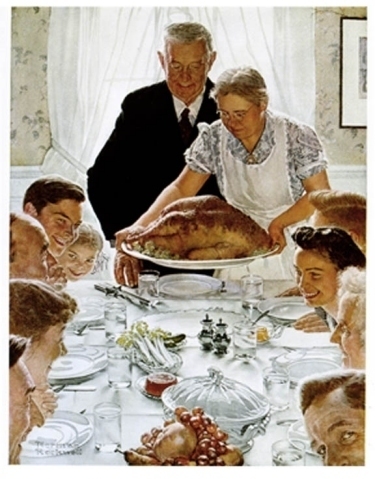 Norman Rockwell’s famous painting from 1943 “Freedom from Want”(just one in a four-part series of “freedom” paintings inspired by Roosevelt’s State of the Union Address) embodies perfectly our ideal Thanksgiving family gathering. The family is gathered at the table while the mother, or grandmother, places a large turkey before her husband. The painting was commissioned to promote the importance of tradition and family togetherness as a means of rediscovering American values and strength after the war. But the painting is a an illusion, and reflects instead the American obsession with consumerism. Contemporary artists Kent Bellows and John Currin have painted to dispel the Thanksgiving illusion and reveal how the holiday has evolved to center around commodity, greed, and gluttony. While Norman Rockwell created the shiny surface of family ties to hide American overabundance, Currin employs a kind of hybrid surrealism to deftly reveal it. 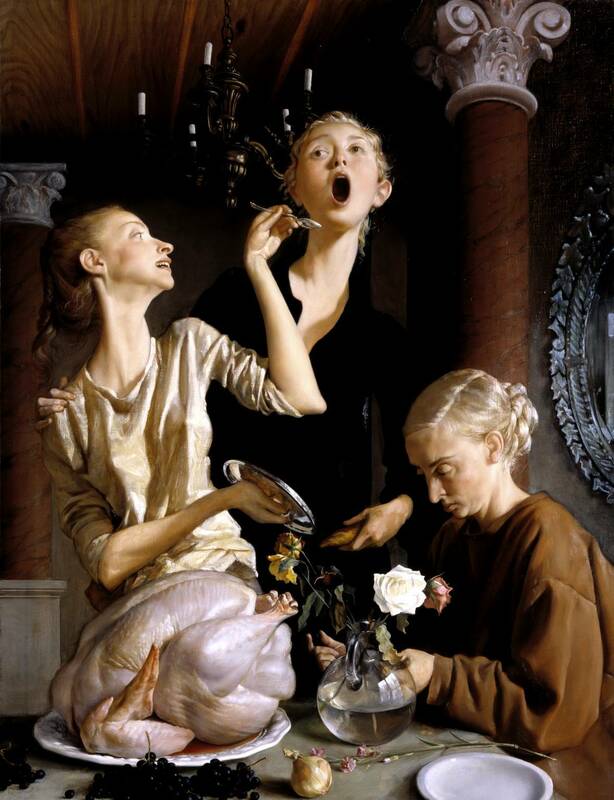 Currin’s “Thanksgiving” (2003) cleverly pulls off a juxtaposition of cruel and tender by utilizing techniques from the old Dutch masters, notably Vermeer and to my mind the Ingres “Odalisque,” to convince us of the real-ness of his unreal women. Their heads are too large, their necks are too long, and their bodies are oddly misshapen ovoid forms. Yet the qualities of detail are so rich and carefully constructed that there is an unsettling harmony between the disturbing exaggerations and luxurious details and we are convinced of the image as a reality. Currin pulls it off by balancing the old masters’ techniques of accurate depiction with the more nuanced and searching qualities of the abstract expressionists to devolve and reconstruct the figure. Besides the Expressionist influence, Currin is taking the absurdities from Surrealism and incorporating this into his canvas to demonstrate the absurdities of causally following a tradition you barely understand. Like the raw turkey; is this family really about to carve into the uncooked bird? And what is being fed to the girl in the middle poised like a baby chicken? Also, nearly everything in the picture is in a series of cycles, each representing three different states of time and decay. The floral center piece is made of roses that are in various states of bloom and wilt, the food depicts three groups—meat, fruit, vegetable— and the women are in three stages of life: maiden, wife/mother, and widow/hag. Is this the cycle of American consumerism? We buy, use, then discard and replace, never truly taking the time to be thankful for having it. Kent Bellows’ “Self-Portrait with Wine Glass” (Gluttony 2000) is another jab at the veil hiding American greed. His painting parodies other traditional Thanksgiving dinner portraits with his mastery of Realism that is simultaneously unsettlingly surreal from his dramatic use of lightening. Bellow’s is quite skilled in creating dream-like drama and anxiety in his portraits that make them different than reality— a kind of hyperreality if you will. With the aim of expressing psychological and emotional states, “Self-Portrait with Wine Glass” assaults our senses with the abundance of food, shine of silver dinnerware, and rich luxury of fabrics and color. The exquisite finery is emblematic of the current state of America’s obsession with possession, status, and commerce. And even the stormy background serves to forewarn us of the dissatisfaction we will eventually feel from the endless cycle of consumerist culture. I think that when people are out shopping for super sale deals on Thanksgiving— a day supposedly and ironically set aside as a time for thankful reflection on what is already had, not for what can be bought for a steal— then it becomes an issue that needs to discussed; or at least brought to light. And that is what Bellows and Currin have done. They have pulled back the veil on Thanksgiving to show the truth. What we are really celebrating is the success of American business and marketing to get people, regardless of their social standing, to wait in lines in the cold for hours to buy items they don’t need at “deals” worth the loss of priceless time that could be spent with loved ones. Am I being dramatic? Perhaps a little, but I really do question the reason for this holiday, or at least our societies’ demand that we still refer to it as “Thanksgiving” when it has truthfully become more of a “Thanks-For-What-I’m-Getting” or ThanksGetting.